When you donate a vehicle to benefit Michigan Radio, you turn your car into the news and information you depend on. Donating a vehicle is fast, easy and secure. 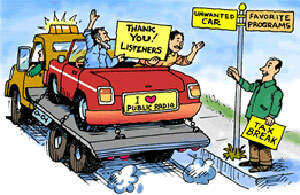 We work with our public radio colleagues at Car Talk Vehicle Donation Services to ensure that your donation delivers the highest possible revenue to Michigan Radio. The Car Talk Vehicle Donation program handles the processing of your donated car, and will mail you a tax receipt. If you need to request a tax receipt, please call the Car Talk Vehicle Donation program at 1.855.277.2346. To begin the process, follow the link below. And thank you in advance!